﻿﻿﻿﻿Smartphones and camera apps are making it easy for photographers to express their creativity. ﻿﻿﻿﻿﻿﻿﻿﻿Smartphones and their larger tablet-type cousins have become integral tools not only in the ways we communicate but in the ways we create. For photographers, downloadable camera apps allow the built-in cameras on most of these devices to become fun and creative tools. Photographers can take an ordinary picture and enhance it with creative photo styles that simulate the unique looks of vintage cameras and special film processes combined with textures and frames. These apps are available for both Android and iPhone. While many are free, most full-featured versions cost around a buck or two. Although there is a wide selection of apps, a few have risen to the top. For the iPhone, favorites include Instagram, Hipstamatic, Snapseed, Photo­shop Express, Camera+ and Pro HDR. For Android, top picks include Vignette, Retro Cam, FxCamera and Photoshop Express. While many photographers may consider these apps to be gimmicky because the images they produce only emulate the looks created with “real” cameras and chemical processes, others embrace their interactivity and creative potential. According to Blank, “It’s like there is a tiny art project just waiting every time I go outside. With nature’s randomness combined with the random looks from Instagram and Hipstamatic, it’s hard not to create an interesting image.” We agree. Maybe we can't be the next Ansel Adams, but some camera apps can deliver results that bring us pretty close. 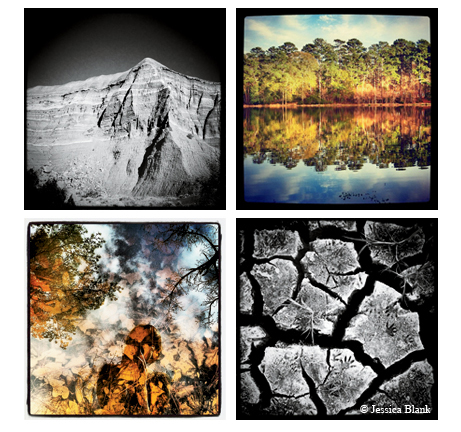 Jessica Blank uses her iPhone and apps such as Instagram and Hipstamatic to produce creative shots. Blank accentuated the tonal values and textures of Palo Duro Canyon State Park and the dried lakebed of Lake Livingston, top left and lower right, using the Hipstamatic app. Reflections in Blank's backyard, bottom left, and Huntsville State Park’s Lake Raven, top right, take on painterly qualities with the use of the Pro HDR app combined with the Instagram app. The popular trend of HDR (high dynamic range) photography has introduced several apps that produce saturated — sometimes surreal — color palettes that can be enhanced even further by reprocessing in a separate app.